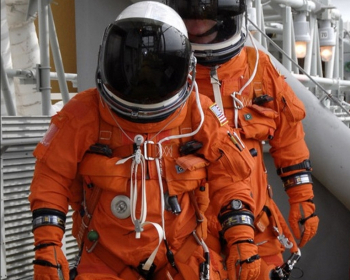 NASA experts are evaluating the use of a modified version of the famous Space Shuttle launch and entry suit – or Advanced Crew Escape Suit (ACES) – for use not only during launch and re-entry for crews riding in Orion, but also for use on spacewalks (EVAs), such as during the proposed Asteroid Redirect Mission (ARM) in the middle of the next decade. As NASA prepares to choose between two robotic concepts for its proposed Asteroid Redirect Mission (ARM), the Agency is also evaluating whether the Space Shuttle launch and entry suits can be modified for use by astronauts – on the crewed leg of the mission – to carry out extravehicular activities (EVAs) from their Orion spacecraft, as they get hands on with the asteroid. ARM is a proposal that begins with a robotic spacecraft traveling to a near-Earth asteroid. Depending on which mission concept is chosen, the spacecraft would capture either a small asteroid or a sample of an asteroid and then drag that into a high Lunar orbit. An Orion spacecraft with a crew of two astronauts would then be launched on the Space Launch System (SLS) rocket to rendezvous and dock with that spacecraft, retrieve asteroid samples and return home. “We’re going into the downselect (this week) and then we’ll go do a mission concept review in mid-February,” noted Steve Stich, head of the new Exploration Integration and Science Directorate at the Johnson Space Center (JSC) to NASASpaceFlight.com. Per the evaluations, Mr. Stich is overseeing whether the Shuttle launch and entry suit – the ACES – can be modified for use not only as Orion’s launch and re-entry suit, but also for EVAs on the ARM. “What we’ve been trying to do with the Asteroid Redirect Mission is to be as efficient as we can with everything that either exists within our toolkit, or with some small modifications,” he noted. For the ARM, the astronaut sample retrieval is planned to only utilize the Orion spacecraft. Mr. Stich explained that the EVA suits – currently in use on the International Space Station (ISS) and previously on the Space Shuttle – have some disadvantages given that requirement. Stich noted that the Orion program had already discussed using a derived version of ACES for launch and entry, likely based on its awareness of the volume constraints. “(Compared to Shuttle) Orion is very small and that doesn’t work very well. 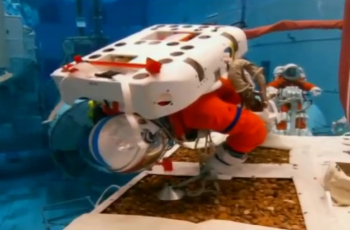 So they were going to use this suit anyway; (since) it’s designed to go to vacuum – because if Orion loses pressure (the suit has) to protect the crew. Shuttle crews used ACES from 1994 through to the end of the program. However, it has rich history ranging back to the early days of human space flight. “That suit is almost a derivative of the suit used for Gemini, way, way back in the Sixties,” Mr. Stich added. “It’s changed a little bit over time, (but) the important thing was can we do (EVA) tasks. “We actually practised a few tasks in the Neutral Buoyancy Lab (NBL) with some pretty complicated Station assembly tasks where you would take off a GPS box that’s outside on the truss and we showed the crew could do it. “We did a fair amount of work over the last 18 months to convince ourselves that this suit – this concept – looks feasible,” Stich noted. “The crew office (Astronaut Office) has been involved, we’ve had four or five astronauts that have flown on Space Station (and) done EVAs in the Space Station suit. 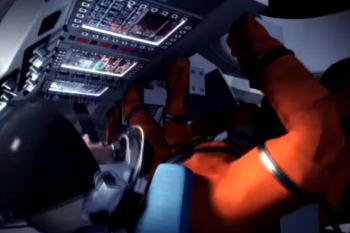 Footage from a promotional video provided to a recent political hearing showed images from NBL runs using the suit during a mock up mission involving the hammering of samples free from an asteroid’s surface. Mr, Stich, a former Space Shuttle flight director, recently became head of the new directorate overseeing evaluation of the MACES concept. “It’s called (the) ‘Exploration Integration and Science Directorate’ at JSC (Johnson Space Center), newly formed on August 11th, so we’ve only been existence a few short months,” he added. “We’ve combined what was ARES, the Astromaterials Research and Exploration Science organization. They do sample curation – they do comet sample curation, they do asteroid sample curation – and we’ve combined that with EVA, Exploration, mission planning, and integration and partnerships all in one office. Mr. Stich added that a big focus area in this new directorate is integrating Orion and SLS and planning missions. “The directorate makes sense in that you bring together scientists with spacewalk experts and then mission planning experts for these Exploration missions and put those all in one directorate together.